So… we know the word ‘miracle’ has been overused when it comes to skincare. But based on our own experience of this new serum – and our testers’ rapturous reception of L’OCCITANE’s Immortelle products to date – we think it’s justified. The premise is relevant to pretty well every woman we know: our lives are likely to be more full of stress of every kind from worries work (or lack of it) and family to pollution. In tandem with this, we sleep two whole hours less each night than people did in the 1960s (which is a bit of a stunner, frankly). The result? We are tired and so is our skin. Call it ‘face fatigue’. We wake up with our complexions looking tired, dull, probably dry – and any sensitivity problems such as redness or blotchiness tend to be magnified. Oh, plus a bonus of puffiness and fine lines. Sarah has a particular reason for being grateful after a Very Bad Back Week, which meant broken nights squeaking in pain. Double doses of Reset, which she had already been using for several weeks, really did help to bring her sad-looking skin back to its usual happy state. We have always loved – LOVED!!! – L’OCCITANE’s products across the range. But the brand’s development of the extraordinary anti-ageing properties of Immortelle was undoubtedly a breakthrough in skincare. Immortelle is a little shrub growing in Mediterranean countries belonging to the plant family called helichrysum, which means literally ‘sun gold’. The plant extracts are stuffed with antioxidants to help boost cell renewal and firmness. Over the last five years, L’OCCITANE Immortelle products have consistently wowed Beauty Bible testers, almost invariably romping home with Gold Awards. The power ingredient trio in Reset also features Acmella oleracea extract, dubbed a ‘natural botox’ for its ability to relax muscle tension under the skin, plus marjoram, which helps kick start our complexion’s own healing and restoring properties. Jo – who was unswervingly devoted to Divine Harmony serum (a much pricier option) is a complete convert. 'It's definitely line-smoothing, glow-getting – and I wouldn't be without it,' she comments. 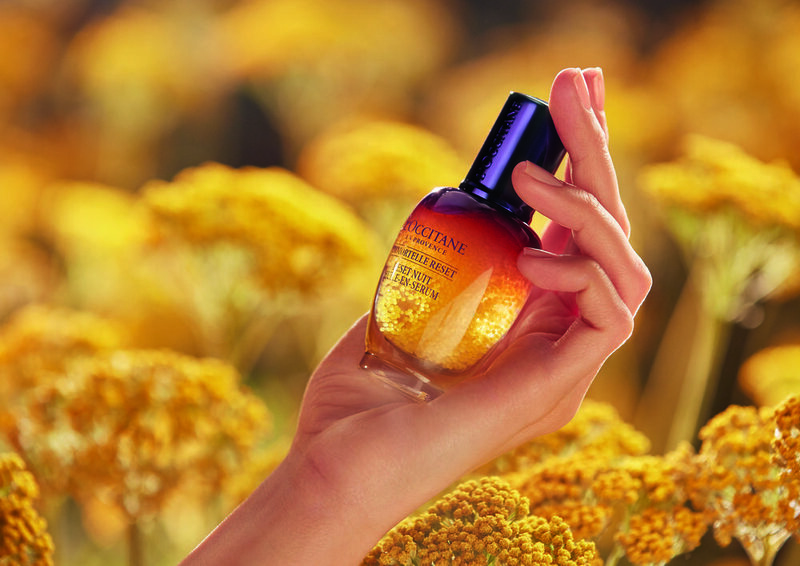 We are thrilled to bits to be able to share this new L’OCCITANE Immortelle Overnight Reset Serum with you so that eight Beauty Bible readers can try this skin-cherishing serum for free. If you can’t wait to invest in Reset, you can order online at loccitane.co.uk/£49 for 50ml (which lasts a long time).